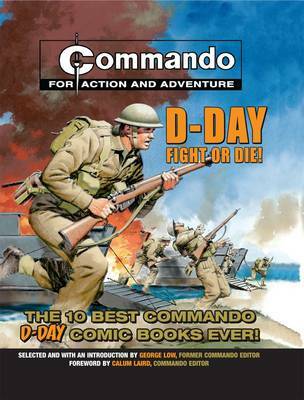 This is the Ten Best D-DAY Commando Comic Books Ever! D-Day was the largest amphibious invasion in history and one of the world's most famous military actions. It has become the stuff of legend through films such as "Saving Private Ryan" and TV series such as "Band of Brothers". This hard-hitting anthology of war comic stories covers all the heroic action of "The Longest Day", 6 June 1944. From "Ambush at Dawn", "Normandy Drop" and "Blood of Heroes" to "Operation Bulldog", "Commando: D-Day Fight or Die!" features ten action-packed stories of the Tommies who stormed Hitler's formidable Atlantic Wall from air, land and sea - and won.